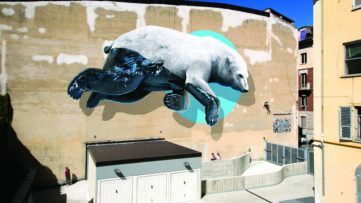 After three successful editions, it is more than safe to say that the Urban Art Fair is one of the annual Spring highlights of the Parisian cultural calendar. With nearly 20,000 visitors enjoying artworks on the premises of Le Carreau du Temple, this event will once again put on a show dedicated to the urban art market, thanks to both local and international exhibitors and a long list of established artists. But the excitement and quality works go beyond the exhibition walls once again, as Urban Art Fair has prepared a rich program of live painting, film screenings, and digital experiences – leaving us to expect nothing less than an exciting appointment with the best that urban, street and graffiti art have to offer today. 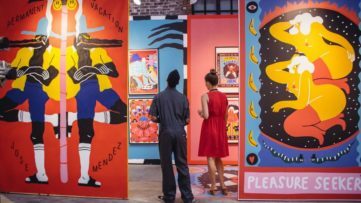 Let’s take a look ahead at Urban Art Fair Paris 2019! Filling the exhibition space at UAF this year, there will be a total of 32 exhibiting galleries, 11 of which are having their debut. Among them, we have Wunderkammern from Milan and Rome, Nelly Duff from London, the Parisians Ground Effect and 193 Gallery, as well as Galerie At Down from Montpellier and ArtCan Gallery from Marseille, France. Among the returning exhibitors, we have Urban Spree from Berlin, bringing a 2-meter-high installation by artist Evol, a rare find on the French art market. French street artist Mist, on the other hand, will present a monumental three-meters-by-forty sculpture on the fair premises, under the central nave of Le Carreau du Temple. At Galerie Openspace, Maxime Drouet will present a 12-meter retro-illuminated tunnel exhibition, while Galerie PDP will curate a show dedicated to emerging urban artists under their wing. Two important English artists, Ben Eine and Dotmasters, will be in charge of a live performance and on-site painting, before our very eyes. Make sure you also visit the booth of the Parisian book store Le Grand Jeu, always ready to surprise us with special curated editions dedicated to the artists and styles of the great urban art movement. Following their successful collaborations for previous editions, Urban Art Fair and Urban Films Festival are once again teaming up to produce screenings of a new selection of short films and documentaries. Their spot is reserved for April 13, and on the list there will also be XArt, directed by Cédric Godin. 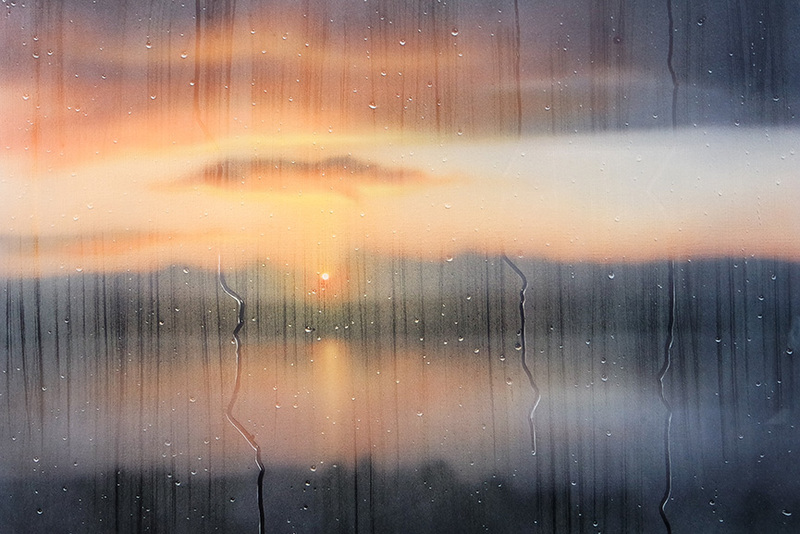 Within the booth of the Fotozino app, the visitors will have the chance to create permanent memories of UAF in Paris 2019, by creating photographs featuring details of artworks by artists presented at the fair. Under the theme Nature & Destruction, The Man as a Social Animal, the fair has created a special sector dedicated to street artist Ludo. Between April 1 and 14, and in collaboration with Citadium, he will work the façade of Le Carreau du Temple to create a monumental collage in his trademark style: fluorescent green color, hybrids of animals and technology in black-and-white… Ludo will also present an in-situ pop-up work for his brand GreedStrategy. Artists Laurence Vallières and Dan Rawling, on the other hand, will each create outdoor sculptures, in partnership with Urban Art Fair and the City Hall of the 3rd district of Paris. 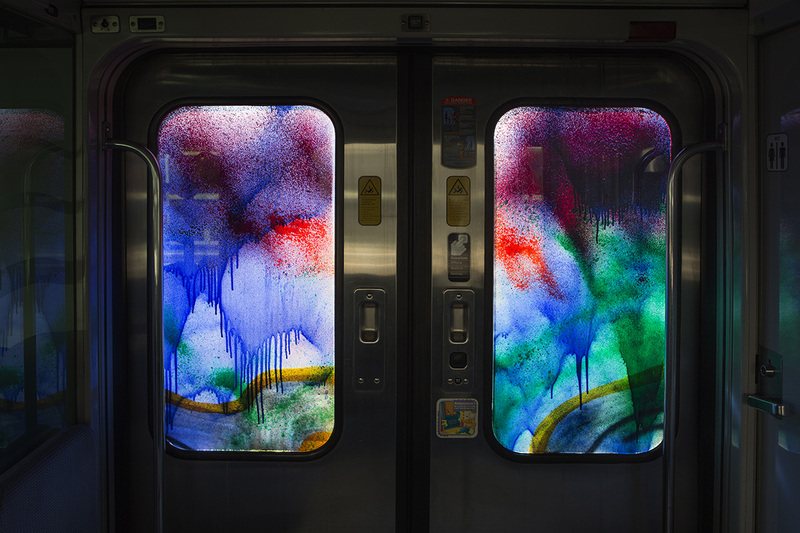 These works will highlight ”the impact of the street on nature” and will surely draw the attention of the visitors. Laurence Vallières is known for her cardboard works, typically of animals in various sizes, while Dan Rawling works with a variety of typical and atypical materials, to create social commentary. 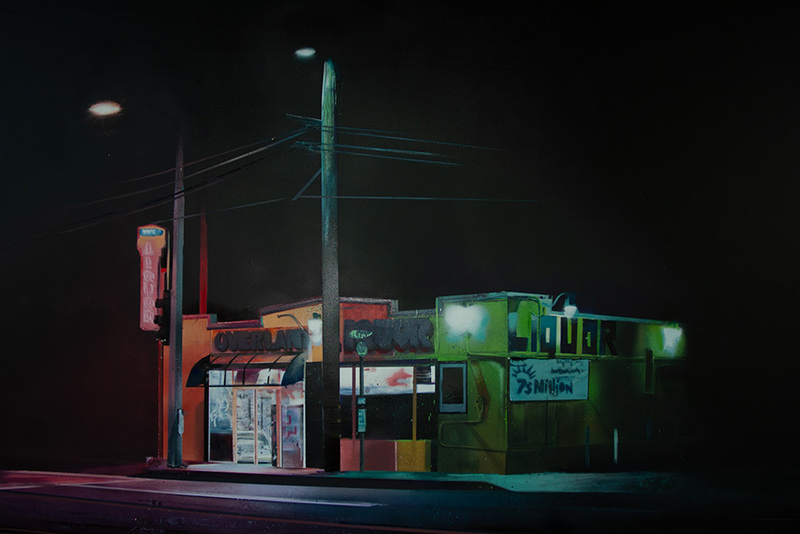 The Urban Art Fair will be held from April 11 through 14, 2019 at Le Carreau du Temple in Paris, France. The VIP Preview is scheduled for April 11 from 11 am to 6 pm, while the opening is from 6 pm to 10.30 pm. Fair hours will be 11 am to 9 pm on April 12 and 13, 10 am to 7 pm on April 14. Ticket prices range from 15€ for the regular daily ticket, to 10€ for students, persons under the age of 18, disabled persons, and the unemployed. Entrance is free for children under 12. 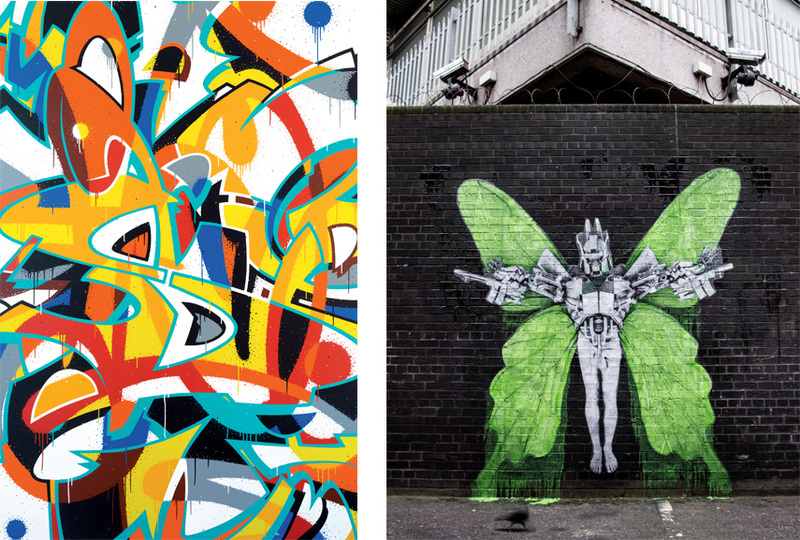 Featured images: Maxime Drouet – Later It Will Be Art. 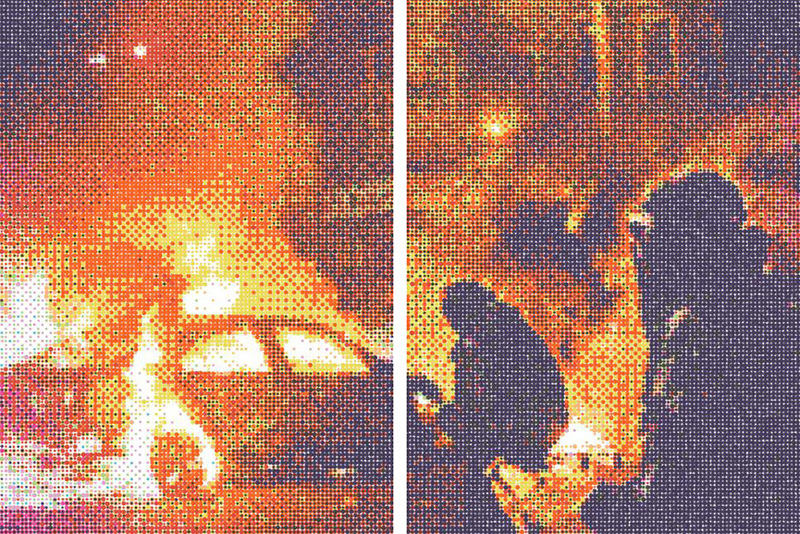 Galerie Openspace; KAN – Riots. 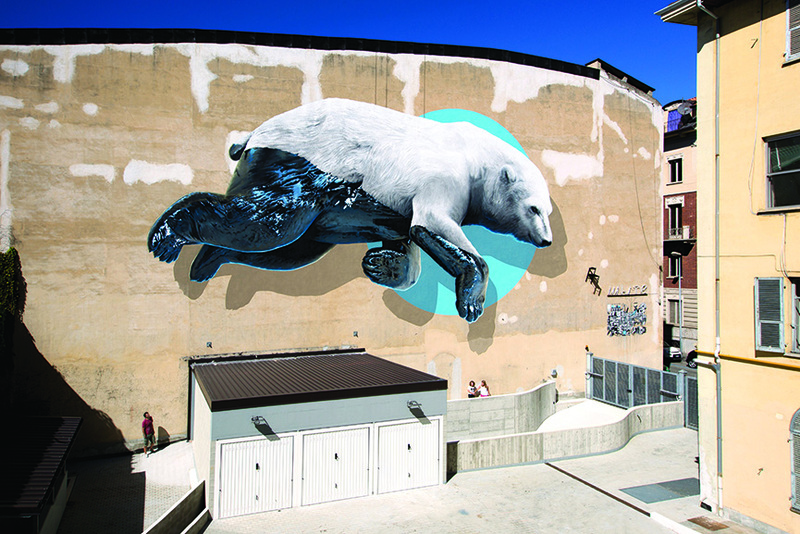 Galerie Under the radar; NEVERCREW, Teatro Colosseo Torino, 2015. Galerie Artrust; Saype – 7h26, Neuchatel, 2019. 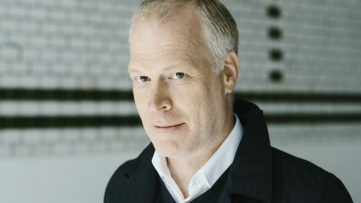 David Pluskwa; Spyk. ArtCan Gallery. All images courtesy Urban Art Fair.